What I really like about those gratins is that they’re very versatile. They can be served as an appetizer with a mache salad on the side or accompaniment to any meat dish or fish. I served them with grilled chicken breasts strips and wrapped in prosciutto with sage and garlic inside, drizzled with olive oil and lemon (see pic below). Gratin Dauphinois is a typically French dish that originated from the Dauphine region and is made with only potatoes. Then many variations exist, this one is made with leeks, oyster mushrooms and potatoes. Wash mushrooms and cut in medium size pieces. Heat a pan with olive oil, add shallots, when shallots are browned, add mushrooms, salt and pepper. When water is evaporated add the cream, reduce for about 3 minutes until the cream is thickened. Set aside. Add olive oil in a pan and heat the oil, then add the crushed garlic, stir to bring out the aroma, make sure to not burn it, then add the leeks, salt and pepper. Cover and cook until the leeks are tender. Set aside. Peel the potato and cut with a mandoline or a slicer in thin slices about 1 to 2 mm think (a little thicker than a potato chips. Grate the cheese and set aside. In some individual molds, (I use the silicon ones – the round about 10 cm diameter wide and 3 cm height), place 3 to 4 potato slices at the bottom to cover the surface, add salt and pepper, then add a layer of mushrooms, sprinkle with some cheese, then add a layer of leeks. 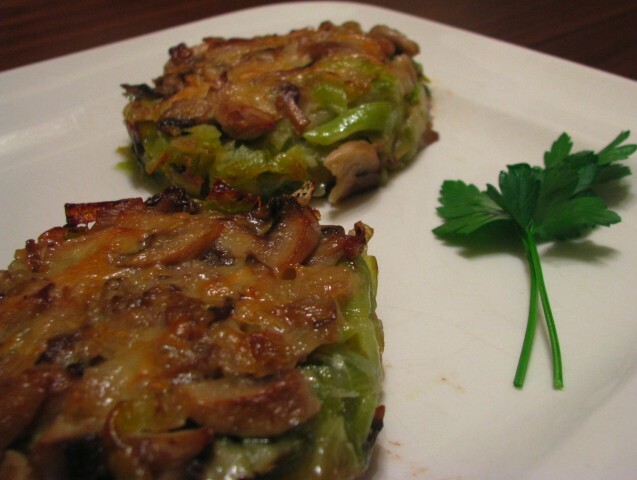 Start again with the potatoes, mushrooms and leeks and top with the cheese to make it “gratine” (melted and browned). Place in the oven at about 375F for about 30 minutes, until the potato is tender and the top is browned. This entry was posted by silvia on December 9, 2008 at 5:19 pm, and is filed under Vegetables. Follow any responses to this post through RSS 2.0.You can leave a response or trackback from your own site.